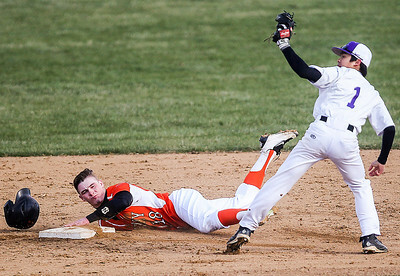 Sarah Nader- snader@shawmedia.com McHenry's Matt Nagel (left) safely slides to second while Hampshire's Tyler Maglaya waits for the ball during the third inning of Friday's game at Peterson Park in McHenry April 8, 2016. Sarah Nader- snader@shawmedia.com Hampshire's Tyler Maglaya (left) fields a ball while McHenry's Bobby Miller runs safely to second during the second inning of Friday's game at Peterson Park in McHenry April 8, 2016. Sarah Nader- snader@shawmedia.com McHenry's Colton Klein celebrates a double during the second inning of Friday's game against Hampshire at Peterson Park in McHenry April 8, 2016. 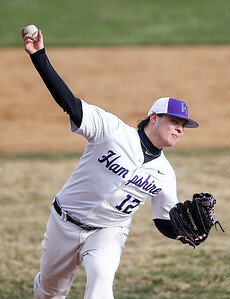 Sarah Nader- snader@shawmedia.com Hampshire's Michael Kruse pitches during Friday's game against McHenry at Peterson Park in McHenry April 8, 2016. 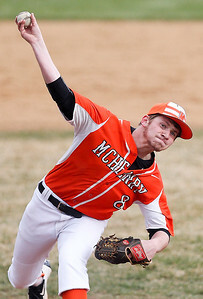 Sarah Nader- snader@shawmedia.com McHenry's Nick Lahrman pitches during Friday's game against Hampshire at Peterson Park in McHenry April 8, 2016. Sarah Nader- snader@shawmedia.com Hampshire's Kevin Michaelsen throws to first during the second inning of Friday's game against McHenry at Peterson Park in McHenry April 8, 2016. Sarah Nader- snader@shawmedia.com Hampshire's Kyle Homa catches a ball to first during the third inning of Friday's game against McHenry at Peterson Park in McHenry April 8, 2016. Sarah Nader- snader@shawmedia.com McHenry's Justin Celeski fields a ball during the fourth inning of Friday's game against Hampshire at Peterson Park in McHenry April 8, 2016. Hampshire's Kevin Michaelsen throws to first during the second inning of Friday's game against McHenry at Peterson Park in McHenry April 8, 2016.